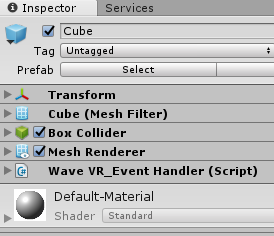 In WaveVR, we provide several scripts and samples showing how to use Event System in a VR environment. If a VR environment does not have a controller, how does the user control items? Gaze is sending events through the Event System to the center of the screen where a user is looking. When Game Objects receive events, corresponding actions are taken. In this document, WaveVR shows how to use the Event System on multiple controllers. Event Handler is used to handle events . WaveVR provides a sample script WaveVR_EventHandler in Assets/WaveVR/Extra/EventSystem. Developer can simply copy the script and overwrite APIs in region #region override event handling function. 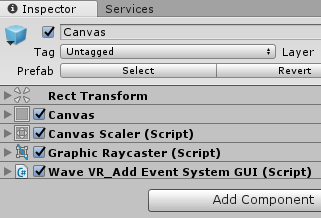 Add WaveVR_AddEventSystemGUI to Canvas which can receive events. Let’s have a practice from beginning. When adding a Button, Canvas and EventSystem will also be added automatically. Remove Main Camera, drag WaveVR from Assets/WaveVR/Prefab/ - for enabling WaveVR rendering. 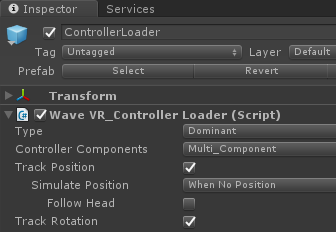 Drag ControllerLoader prefab from Assets/WaveVR/Prefabs/ and choose options - for using a controller. Drag InputModuleManager prefab from Assets/WaveVR/Prefabs/. 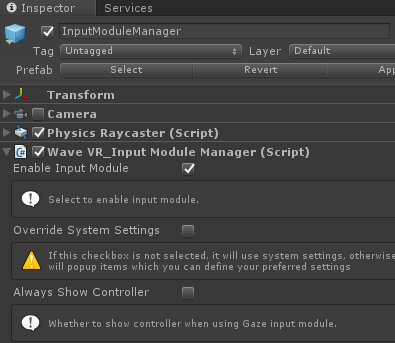 Add component WaveVR_AddEventSystemGUI to GUI (Canvas of Button). Done. Now developer can play scene in editor mode to see the effect. Hint: use Right-Alt + mouse to controll the controller in scene.